Today’s article provides the first quarterly update on RIN generation for 2018. Generation figures and projections are based on available data from EPA’s EMTS through April of 2018, with annual projections compared with the target mandate levels outlined in the final rulemaking for 2018. The previous RIN update (February 8, 2018) provided summary net generation estimates for the 2017 compliance period. Through April, a total of 62.4 million D3 RINs have been generated, an average pace of over 15.6 million per month. An additional 760 thousand D7 RINs have been generated, coming from cellulosic diesel and heating oil. These generation figures would put projected cellulosic RIN generation at close to 200 million for the year, falling short of the 288 million gallon cellulosic mandate level for 2018 and implying the need for obligated parties to purchase cellulosic waiver credits for 2018 compliance. 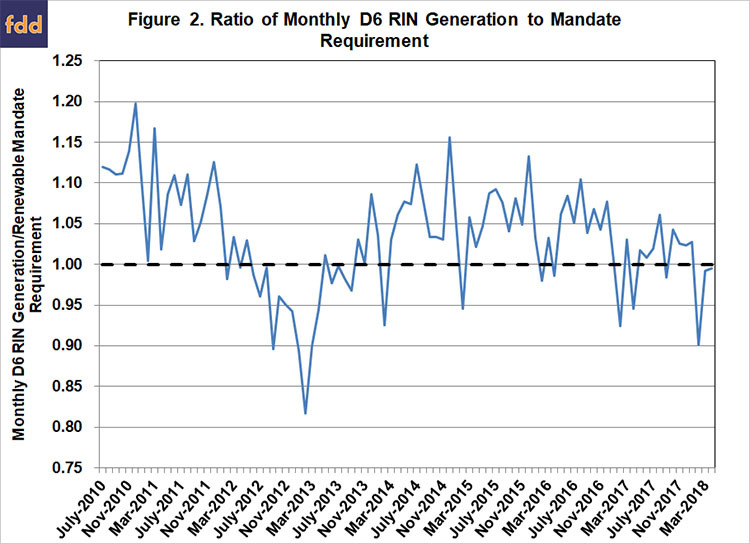 Figure 1 plots monthly D4 RIN generation relative to implied monthly mandate needs (annual mandate divided by 12) using data from the EMTS through April 2018. Gross generation of D4 RINs have totaled more than 1.1 billion, averaging over 275 million per month through April. This is 13% (16%) higher than the rate of generation over the first four months of 2017 (2016), suggesting that generation of D4 RINs in 2018 will likely exceed the 2017 total of 3.85 billion and potentially approach the more than 4 billion generated in 2016. This would provide sufficient D4 RINs to meet the 2.1 billion gallon (3.15 billion RIN) mandate for 2018, while also providing surplus D4 RINs to apply towards the total non-cellulosic advanced mandate. Gross generation of D5 RINs has averaged close to 7.5 million per month through April, totaling nearly 30 million and exceeding the pace of generation in 2017. This implies projected annual generation of more than 150 million D5 RINs in 2018. Combining the D4 and D5 RIN generation projections results in a total estimated gross generation at or slightly exceeding the roughly 4 billion RIN non-cellulosic advanced mandate level for 2018 (4.29 billion total advanced less the 288 million cellulosic). Of course, retirements of a portion of those RINs due to biodiesel exports and non-compliance purposes will ultimately reduce the amount available for compliance. Export data from the EIA reports 8.6 million gallons (12.9 million RINs) of biodiesel exports through February, which is more than double the level of exports reported over the first two months of 2017. Over the past 3 years, biodiesel exports have been fairly stable around 90 million gallons (134 million RINs) each year. 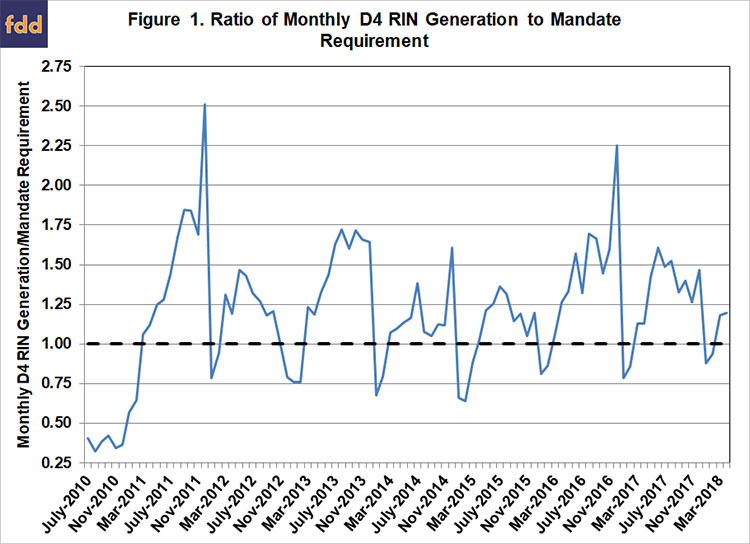 Figure 2 plots D6 RIN generation relative to implied mandate needs through April 2018. Monthly gross generation has averaged 1.224 billion in the first quarter, just slightly above the pace of generation at the same time last year. This results in projected gross generation of more than 15.1 billion D6 RINS in 2018. While this rate of generation would be sufficient to cover the 15 billion RIN renewable gap portion of the overall mandate for 2018 (19.29 billion total less the 4.29 billion advanced mandate), a portion of these D6 RINs will be unavailable for compliance due to ethanol exports and other non-compliance retirements. Exports of denatured ethanol have averaged around 500 million gallons annually over the past 3 years. Through the first quarter of 2018, 191 million gallons of denatured ethanol exports have been reported. This is above the average rate of first quarter ethanol exports experienced over each of the past 3 years. Data on RIN generation from EPA’s EMTS through the first four months of 2018 indicates that the rate of gross generation of all categories of RINs is generally above that experienced in 2017, and may be sufficient to meet compliance requirements for all but the cellulosic portions of the RFS mandates for 2018. However, the pace of RIN generation can fluctuate throughout the year, and exports of biodiesel and denatured ethanol will reduce the amount of RINs ultimately available for mandate compliance. Future quarterly updates will continue to track RIN generation and biofuel export data to assess the ability of obligated parties to meet mandate requirements for 2018. Paulson, N. "2017 Year End RIN Update." farmdoc daily (8):21, Department of Agricultural and Consumer Economics, University of Illinois at Urbana-Champaign, February 8, 2018.